I was so excited when I found these unexpectedly at Walgreens the other day. This is from the new Salon Effects line my Sally Hansen. Pictured here is Laced Up. These apply pretty much exactly like Incoco, though I haven't gotten a chance to try Incoco's new Design line yet to compare. My Incoco review and mini-tutorial is here. What I REALLY like about the Salon Effects vs. Incoco is that each "hand" of stickers comes in its own package. If you have shorter nails like I do, you can use only ONE pack at a time by cutting them in half. Of course, I ended up having to trim a couple strips to the correct nail size, but it's worth the extra effort to get double the number of manicures from each one (especially at $8.50 - $9.99 depending on where you get them)! My mom and I actually got a bunch of designs and split them up so we each had a package of all the designs. Also, I love how readily available they are. I found some at Walmart and some at Walgreens (which had a bigger selection). They claim to last up to 10 days and I REALLY wanted to test it since I've had Incoco last 11 days for me once, but I was so anxious to try some new transfer foils that I HAD to take them off today. This was day six and they still look wonderful, although I did file some minor tipwear off on day four. I'm guessing these definitely could last for 10 days on some people. Have you tried any of the "stick-on" nail polish like Incoco or Salon Effects? Do you like them? I love it!! I picked up the same one last night! Alas, not available in the UK as far as I'm aware *sigh* I've seen some alternatives that I might have to try. This looks lovely on you Goose. Amazing! I really appreciate it. 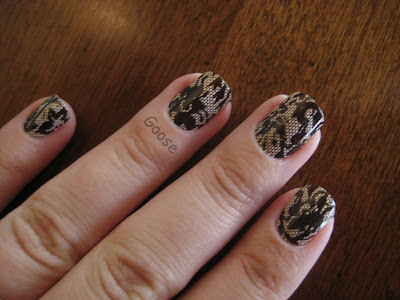 I've tried the Kiss Nail Dress and had a hard time keeping it smooth on my nails. I also have the Sally Hansen but havent had the nerve to try it yet because being stuck with creases and folds will make me angry that I wasted the $9.